Many colleges have first-year transition programs and these are a real asset for students who may need extra academic support and help adjusting to college. These programs come in all shapes and sizes: some happen in the summer, some happen the week before school starts, some happen during the first quarter or semester, and some last the whole first year. Some of the programs will feel like a camp that begins and ends, some like a club you join and where you make friends, and some like a class that is led by a professor. Whatever the flavor of the program, they are fabulously helpful to a first-year student. These programs can be targeted at first-generation students, certain minority groups, or specially recruited students, but often you have to disclose your interest on orientation forms the college will send out after you are accepted. DO IT. This is a fabulous way for you to get experience at college before or as it starts, with other students who also really want to succeed. You will be taught things like how to register for classes, how and when to buy your books, where the academic support services are on campus and when to go, how the college will help you get a job, study skills, how to write a good paper for college, etc etc. If you have a question about it, it will likely be addressed at some point during your program. Some schools call these Bridge Programs, others call them Summer Early Experience Programs, and most colleges have their own names for these great events. 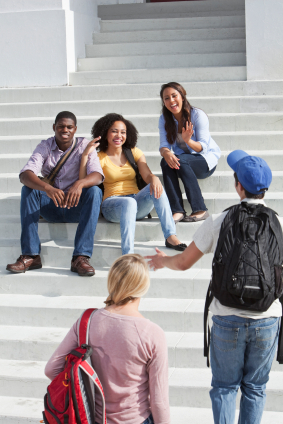 One of the very best ways to succeed in college is to find and build a support network, and what I really love about first-year transition programs is that you are made aware of all of the resources that will help you succeed, and you meet a group of students who are exactly in your same boat. Special note: If you are the first generation from your family to go to college, aka “first gen”, ask your adviser and RA on campus if there is a group for first gens to meet each other. This is a great way to meet other people who are also learning the ropes of college totally on their own. Research shows that one of the very best ways for anyone to succeed in a new challenge is when they have support from people similar to themselves. Find these people on your campus, and if the group doesn’t exist, start it! Lots of First Gens will thank you.